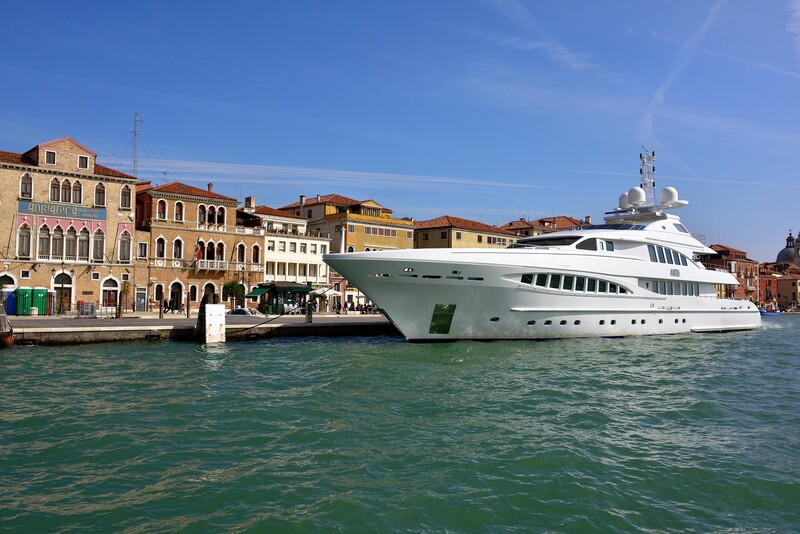 Read the full Croatia Charter Guide and Venice Charter Guide. A 12-day private yacht charter itinerary visiting the finest locations in Croatia cruising towards Venice. Kotor is UNESCO World heritage town of rich culture and one of the best preserved natural and historical heritage sights in the Mediterranean area. The Bay of Kotor is awesome to behold so be sure to settle in above deck as you exit, it’s a magnificent spectacle. The Bay of Cavtat is where you would clear customs between Croatia and Montenegro but it’s also a great place to stop. This is a very picturesque bay and is often referred to as the ‘St Tropez’ of Croatia. The tree lined boulevard is filled with cafes and restaurants. Cruise to Dubrovnik and drop anchor, go ashore and explore, continue onto Sipan to anchor off for the night. Dubrovnik is on the UNESCO World Heritage List and is one of the most beautiful Mediterranean cities. Its high stone city walls and the beauty of its ancient city center has for many years attracted the likes of artists, historians, scientists and chance travelers. The center of the city is Luza Square from where the main street Stradun spreads towards the west. Nearby is Sponza Palace (the Dubrovnik Republic Archives) and Orlando's Column from the 15th century in the center of the square. On the southern side of the square is the church of St. Blaise, patron saint of the city, the City Hall (19th century), National Theatre from the same period, Rector's Palace (15th century), Bishop's Palace and the grand facade of the Baroque Cathedral (17th century) is on the western side of M. Drzic Square. Once back onboard, continue onto Sipan enjoying a lovely 3 hour evening cruise, anchor off for the night. This is a small restaurant serving amazing sea food and offering great service. The recipes are secrets that chef and owner, Marko will pass to his son Gino, (waiter) when the time comes. After all, Marko is not even 70 years old yet. I’m told by my Croatian contacts that this is a must do! Depart Sipan early and head to lovely Mljet, this is the greenest island of the Adriatic; enjoy breakfast upon arrival in stunning scenery. Visit the National Park and the beautiful interconnecting lakes of Veliko Jezero and Malo Jezero. “For most people, Mljet is an island lost in the open sea.” Mljet National Park has been proclaimed as an area of special interest as the salt lakes are a unique geological and oceanographic phenomenon of worldwide importance. They originated approximately 10,000 years ago and, until the Christian era, they were freshwater lakes. Beautiful, rich forests once covered large areas of the Mediterranean Coast, but they are rarely preserved today as beautifully as they are on Mljet. The woods on Mljet gently descend all the way to the surface of the lakes, thus creating an image of unspoiled nature. The 12th century Benedictine Monastery of St. Mary is on Big Lake. The small island is an exceptional example of cultural and historical heritage dating back to the eras of the Illyrian tribes, the Roman Empire and the Republic of Dubrovnik. One can see that this island is living on its' own time, by its' own rhythm. Magic becomes almost visible after you take a walk or bike ride along shores of lakes inside National Park Mljet. Anchor at Polace bay, from where it is very easy to reach the lakes - with minivan included in your entrance fee, by 20 minute walk or with bikes that you can rent. Probably the experts in stress relief would find reasonable explanations but as far as we are concerned – this is a magical island. After relaxing all your senses, there is right place to have your dinner and wonder once again on perfect, yet opposite temperament of the people living on Mljet and island itself. Lastovo is a small island of 40 square km and a small population of just over 1200. The island has numerous sheltered bays and beaches, wonderful for spending time on the water toys or just simply relaxing. OR visit Korcula famous for its traditional Knight's dance celebrating the Turkish assaults on the island. The island of Korčula is covered in dense forests of aleppo pine, cypress and oak trees. Because of its cultural heritage and numerous legends told over the generations it is undoubtedly one of the most interesting islands in the Croatian Adriatic. The town of Korcula is perched on a peninsula surrounded by strong 13th century walls reinforced with towers and bastions by the Venetians after 1420. The whole town is enchanting. Narrow streets branching off the main road are designed to lessen the impact of the boaara wind. History, architecture, again celebrated wines and wine cellars – all is there. A wonderfully romantic promenade runs through the town by the city walls and is teeming with lively cafes. In the late afternoon, continue onto Split. SPLIT is Croatia’s second biggest city and has a rich cultural history. The UNESCO protected Diocletian Palace in Split was built between the late 3rd and the early 4th century A.D by the Roman Emperor Diocletian. He built the Palace in a large bay on the southern side of the peninsula, close to his birth place Salona. Today the Palace is still home to many residents and to major historical buildings. Architectural historians consider it one of the best preserved late Roman villas, but also cherish the elements of the medieval city as well as the layers of the subsequent historical styles found in the eclectic makeup of the Split city core. Don't miss a chance to have a coffee in cafe bar Vidilica, placed on the first belvedere situated on the eastern slope of Marjan Hill. It can be easily reached by the stone steps mounting from Riva. From above, you can admire the splendid view of the whole city. Some other points of interest? In the morning pay a visti to Town Green Market on the eastern side of Riva, right place to go if you want to buy fresh local products, fruits or just to catch a bit of local spirit. A few other interesting facts: Split is known in whole ex-Yugoslavia area as town full of beautiful women. You will not believe how many shoe stores there are in Split! Split is town of sports - experts will tell you it is because of climate, healthy way of life through the centuries, fresh food and many other reasons, but locals will tell you it is just IN SPITE! 69 Olympic medalists are from Split, 5 NBA players, tennis player and Wimbledon winner in 2000 Goran Ivanisevic and current world and European high jump champion Blanka Vlasic. This IN SPITE spirit is also very typical Dalmatian thing. You think we can't do it? We'll do it “IN SPITE”. Elegance is the word at this established restaurant. The kitchen serves up traditional Croatian fare including an abundance of fresh seafood and delicately roasted meats. Look out for dishes that include delectable Istrian truffles—yummy and decadent. Owned by the father of one of Croatia’s most famous pop stars, Adriatic Grašo is the hip dining spot in Split, attracting famous athletes, politicians, and singers alike. Star-power aside, this restaurant offers the opportunity to dine on the freshest seafood while enjoying breathtaking views of the Adriatic. Whether you eat out on the terrace or inside next to the wall made up entirely of floor-to-ceiling windows, you are sure to have a delicious and languorous meal, fueled by the slow-food movement and wonderful Croatian wines. The schedule for today can be further discussed with the Captain once you’re onboard but you may wish to leave Split after the new guests are onboard and cruise the very short distance to Trogir. Trogir is actually a few minutes closer to Split airport than Split is and they could easily take Belinda ashore in the tender for her later flight. This would allow you the opportunity to explore somewhere different. TROGIR sits on a small island just of the Croatian mainland, and is one of the jewels of the Dalmatian coast and is a town of extraordinary architectural beauty. The Greeks of Issa first settled here in 380BC, when they founded the fortified town of Tragyrion (island of goats) which became Tragyrium under the Romans in 78AD. In the Middle-Ages Trogir was under the protection of the Byzantine fleet, but in 1123 it came under attack, and destroyed by the Saracens, abandoned by the few surviving inhabitants. It revived again 70 years later and a period of extraordinary artistic growth ensured, first under the kings of Hungary and, from 1420 under Venetian rule. In 1997, Trogir gained listed status as an UNESCO World Heritage Site. Most of the old historic center of the town is on an island encircled by a wall with two gates. A bridge now joins the island to the mainland and another links it to the island of Ciovo. A the main old town’s heart is the St Lawrence cathedral, which features an elaborate doorway built by Radovan: the designer and historical source and inspiration to the most prominent Croatian writers, sculptors, architects and musicians. Depart early and cruise to the island of Hvar/Paklani islands. Hvar is one of the best known islands in the Dalmatian Group, the town is quaint and beautiful. ‘’Art treasures, a mild climate, good beaches and fields of lavender make this island one of the treasures of the Adriatic. Hvar is home to: The Fortica Hydroarcheological Collection - one of the finest collections of the ancient amphorae in Croatia; The Hanibal Lucic Benedictine Art Collection – is a collection of paintings, icons and other artifacts and objects of everyday use from the convent treasury, The Franciscan Art Collection is housed at the Franciscan Monastery, The Treasury of the Hvar Cathedral, The Bishop`s Museum, Oldest Community Theatre (1612), Renaissance Cathedral with its original tower, the unfinished palace of the poet Petar Hekrorovic with its ponds and arcades and early Christian baptistery”. The most popular beaches of the town Hvar are situated on the Pakleni islands, about twenty islets right opposite the town of Hvar and extend undulating along the south side of Hvar. This archipelago is the most beautiful part of the Hvar Riviera. Early departure from Hvar to Sibenik. Sibenek is in the heart of the Adriatic coast, at the mouth of the river Krka, hidden among the channels, lays the Old Croatian fortress of St. Mihovil. During the 11th century, houses of the town emerged from the bottom of the fortress. As much as, or even more than any other Croatian town, the people of Sibenik owe their heritage to the Western European Christian civilization. Building their cathedral of St. Jakov for a century, they did not know that it would become an eternal and indestructible symbol of the town as was shown by the recent war history. Sibenik has remained unchanged maintaining all of its historical values. Head up the River early to Skradin then continue onto Zadar (for nightlife) or alternatively anchor off Dugi Otok - South side – Telascica. Skaradin is reached by taking a local boat up the River Krka. This National park with its series of spectacular waterfalls is an area of outstanding natural beauty. Enjoy a private river trip during the day; remain in Skradin for the evening dining on delicious fresh shellfish from the local sources. Oysters, mussels and champagne!! Depart after breakfast for Mali Losinj. Spend the day of cruising and anchoring to enjoy watersports in around three anchorages while working our way gradually north to Mali Losinj. A destination for many of Europe's royals; they came to Losinj in search of health and vitality, among them the Austrian Emperor, Franz Joseph, Prince Rudolph, and the Austrian heir-apparent Franz Ferdinand. The oldest and most attractive tourist destination on Losinj is Cikat. Modern hotels stand in the shade of hundred-year-old pines, but there are also villas reminiscent of Monte Carlo built along classical lines by the last representatives of European aristocracy. Losinj's special feature is a colony of dolphins, and there are some 150 registered so far. Dolphins are one of the best indicators of the clean sea. Losinj was the first one in the Mediterranean to be proclaimed as a dolphin reserve. Leave Mali Losinj and cruise to Brijuni. Spend the day in the Brijuni Archipelago which is made up of 14 islands and was declared a national park in 1983. Visitors are only allowed on the two main islands of Veli Brijun and Mail Brijun. There have been hundreds of different plant species introduced to these islands, many of them are now fully matured and now considered living monuments. These two islands have been inhabited since the Paleolithic era. In Roman times there were aristocratic villas and later religious communities here. The islands were abandoned in 1332 because of malaria, but people returned in the following centuries to work the stone quarries. In the late 19th century the islands were purchased by the Tyrolean industrialist Paul Kupelwieser. After WWII the islands became the summer residence of Marshall Tito who introduced many species of exotic animals to the islands. Many of these were gifts from visiting heads of state. Brijuni to Rovinj early (14NM) then overnight to Venice (or depart for Venice very early morning to enjoy breakfast upon arrival. Rovinj was originally an island port built by the Romans. In the square in front of the pier is Balbi's Arch (1680) an ancient city gate, as well as a late – renaissance clock tower. The cathedral dedicated to St Euphemia dominates the town, originating in early Christian times, it was rebuilt in 1736. The adjacent bell tower is 61m high and was modeled on that of San Marco in Venice and is crowned by a copper statue of St Euphemia. Along the waterfront is the Institute of Marine Biology which was founded in the late 19th century and has an aquarium. Many a writer has through the centuries been equally enchanted by Rovinj and its beauty. Disembarkation at Pier Giardinetti pontoon in Venice by 12.00 noon.